The band performance times have been announced for Monster Energy Rock Allegiance, returning for the fourth year to the Philadelphia area this Saturday, October 6. The Northeast's biggest rock experience will feature 20 bands at the BB&T Pavilion & Wiggins Waterfront Park in Camden, NJ, including Limp Bizkit, Papa Roach, Motionless In White, Skillet, Bullet For My Valentine, Of Mice & Men, Beartooth, The Fever 333 and many more. In addition to music, Monster Energy Rock Allegiance will feature Philly-centric food offerings, regional and national craft beer, band meet-and-greets, autograph signings, and more for fans from around the country to immerse themselves in rock and roll culture. 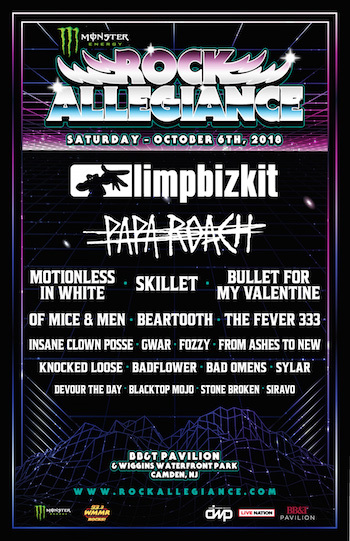 VIP and General Admission tickets for Monster Energy Rock Allegiance are available at www.RockAllegiance.com. As previously announced, Monster Energy Rock Allegiance will also feature a variety of unique entertainment options to go along with the incredible music lineup, including the Monster Energy Experience (where fans can meet Rock Allegiance artists and sample Monster beverages), the f.y.e. Fan Experience (where fans can purchase music from the performing bands and take part in meet & greets and artist signings), Dyin 2 Live / Fxck Cancer (wish-granting organization), and SWFTCharge (quick, portable and convenient phone-charging service). Monster Energy Rock Allegiance is proud to support beer entrepreneurship with a celebration of craft breweries hailing from the region and throughout the nation. The lineup of breweries at Monster Energy Rock Allegiance includes: 21st Amendment (San Francisco, CA), Dogfish Head (Milton, DE), Founders (Grand Rapids, MI), Neshaminy Creek (Croydon, PA), Oskar Blues (Longmont, CO), Spellbound (Mount Holly, NJ), Tröegs Independent Brewing (Hershey, PA), Unibroue (Chambly, QC), and Victory Brewing Company (Downington, PA). The food lineup for the festival includes: Baby Blues BBQ, Chickies & Pete's, Lil Trent's Treats, Nico's Pizza and More!, Sum Pig Food Truck, Tony Luke's Cheesecake, and more. Monster Energy Rock Allegiance is produced by Danny Wimmer Presents in association with Live Nation. Danny Wimmer Presents is a producer of some of the biggest rock festivals in America, including Rock On The Range, Bourbon & Beyond, Welcome To Rockville, Monster Energy Aftershock, Monster Energy Carolina Rebellion, Chicago Open Air, Monster Energy Rock Allegiance, Northern Invasion, the recently announced Sonic Temple Art + Music Festival and more. The festival is fueled by Monster Energy. Additional sponsors include f.y.e., Roadrunner Records, Fxck Cancer and SWFTCharge, and more. Since 1993, music industry veteran Danny Wimmer has been producing concerts and festivals, both large and small. In 2011, he formed Danny Wimmer Presents, which now produces several of the largest rock and alternative festivals in the U.S. By combining A-list talent with local cuisine and culture, DWP has become recognized within the industry for delivering the highest-quality entertainment experiences to fans, artists, sponsors, partners and host cities. DWP creates memorable and all-encompassing festival experiences, leaving both consumers and partners with lasting and meaningful impressions. DWP will continue to add new music festivals to its already stellar portfolio, which includes Rock On The Range, Aftershock Festival, Welcome To Rockville, Carolina Rebellion, Louder Than Life, Bourbon & Beyond, Rock Allegiance, Chicago Open Air, and the recently announced Sonic Temple Art + Music Festival, among others.